I love living for my weekends and seeing new places, even though it means traveling with a toddler. Whether it’s an hour away or several, we fill up our weekend calendars with places, festivals, and events. As a few of our trips approached, fear and anxiety began to develop, due to the changing nature of our little one. How were we going to nap? Is she going to meltdown in the restaurant? What if she doesn’t sleep in the hotel room? And that’s why I wrote this post, not only to share what I’ve learned but also as a reminder for myself. 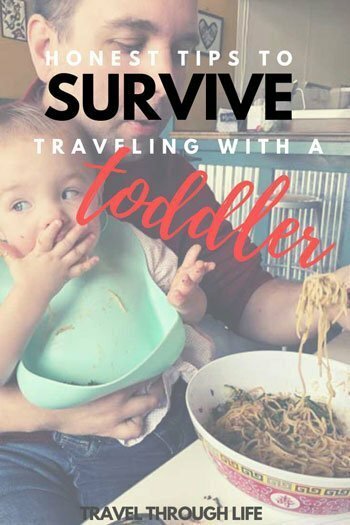 Traveling with a toddler is not impossible, but it’s important to keep these tips fresh on the brain, so we can all keep surviving parenthood without losing our minds! 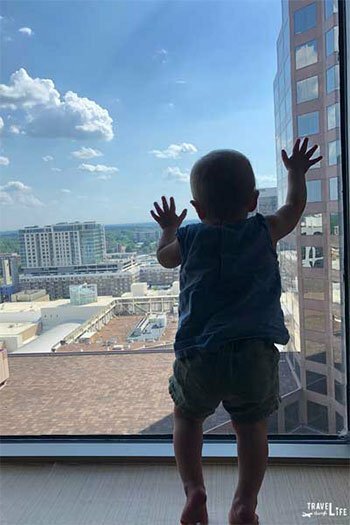 These tips for traveling with toddler feature in our Travel with Kids section and some of the products we mention have appeared in our Travel Packing Lists, too! I apparently gave this advice to one of my dear friends while she was in the middle of a trip and panicking. She reminded me of this while I was confiding in her the day before the longest multi-destination trip we’ve ever taken with our toddler. Routines are for home. Nap times. Bedtimes. 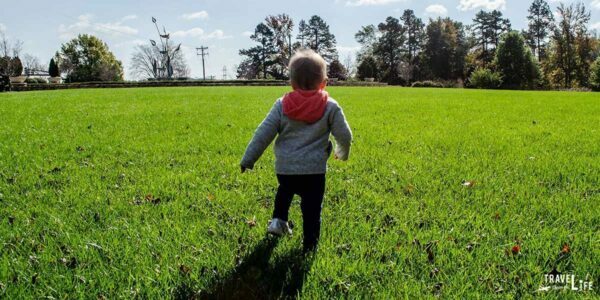 All the things that your traveling toddler knows and does at home are for “home.” When you’re traveling, things aren’t going to be remotely close to your routine life, and that’s okay. Try to let it go and accept when things don’t happen on the road the same way they do at home. Yes, make a list. Check it twice. Make sure you have all the stuff you need. But in reality, if you forgot your child’s favorite lion that sings a little ditty when you squeeze him, life. will. go. on. There’s a Target or even Walmart everywhere. Forget something and can wait a couple of days? Amazon Prime it to your hotel room. Forgot extra wipes at home? Run to Target after the kid goes to bed. 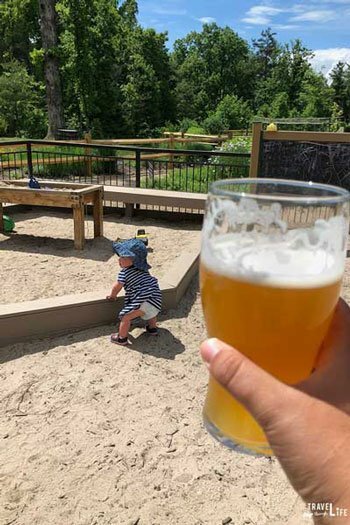 Don’t judge, even if this playground is part of Sierra Nevada Brewing Company in Asheville. We’ve all seen it. That parent who pulls out the iPad at the restaurant. Or the kid on the leash? Parenting is HARD, Y’all. As parents, we always say there is something we will NEVER do and then life gets hard and you’re willing to do whatever it takes to survive. And that’s okay. 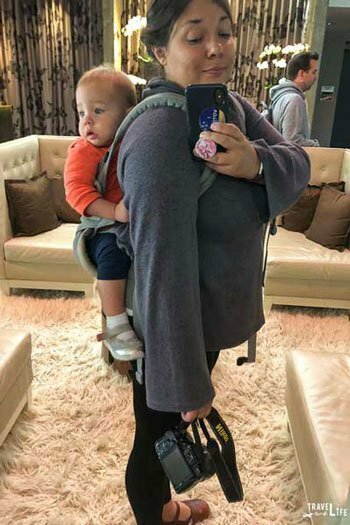 If you survive parenthood, then you’re doing an amazing job! These tiny humans have so many emotions for their little bodies and judging a parent for what they have to do to get by means you’re kicked out of the mommy clan. 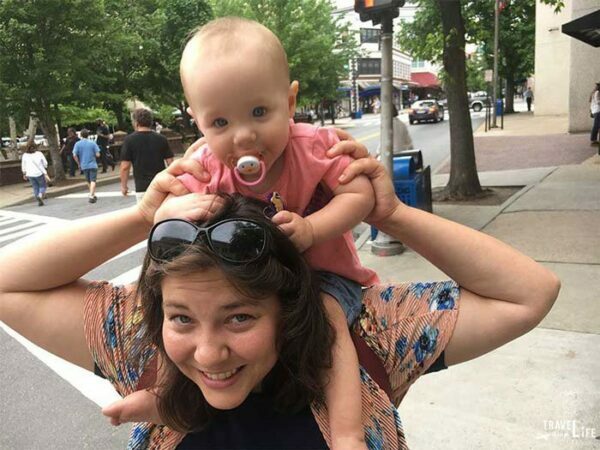 Travel can make parenting even harder, so most definitely keep your eyes on your own kid and relish the moments that aren’t making you cry in the corner. That’s right. Buy them all. Just like tip number one, nutrition is for routine places. At home, I try very hard to feed a balanced meal every time. Snacks are fruit or vegetables and pretzels are not the main staple. But when we’re traveling, I’d rather my child have food when she’s hungry than wait for when it’s convenient. Before each trip, I’ll fill a plastic bin that goes on the back seat floor with midlevel healthy snacks. That’s right, we leave fully stocked with pretzels, beef jerky, pouches, apples, dried snap peas, and more goodness. It’s not an all you can eat buffet, but it’s there for when she’s hungry and then we feed her more nutritious foods during meal times. Want to know how we load up for a trip? 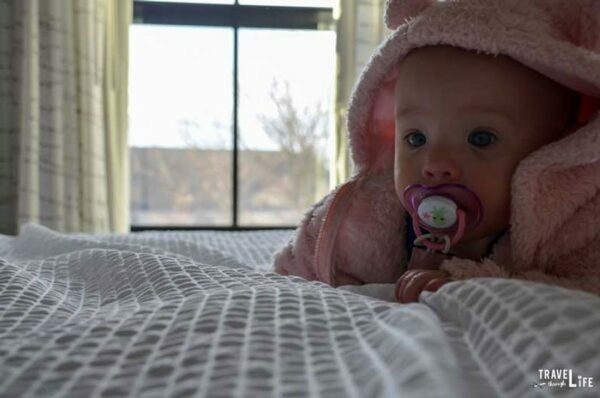 We’ve created packing lists for our baby, from the early months to the not-yet-Toddler ones! It’s true what they say—you don’t need much. I have found after packing a billion travel toys for toddlers that she doesn’t play with hardly any of them. 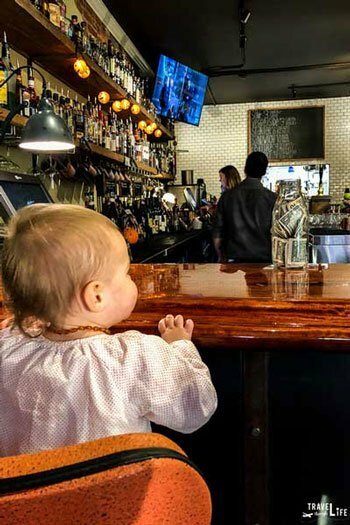 She’s more interested in walking around and looking at people or the chefs in the kitchen than with the lame toy that she can play with at home. 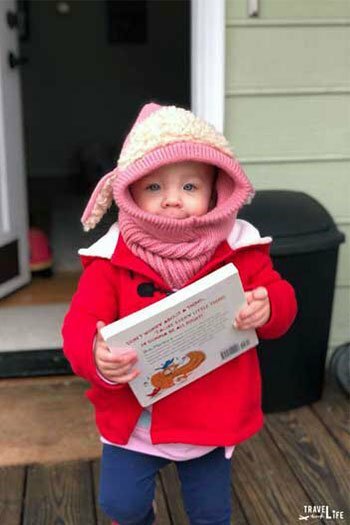 We’ll bring a couple of books and her favorite stuffed animal for the car ride, but you won’t see me lugging around a wooden puzzle to Starbucks! Speaking of books, here are our favorite children’s books that inspire travel in little ones! 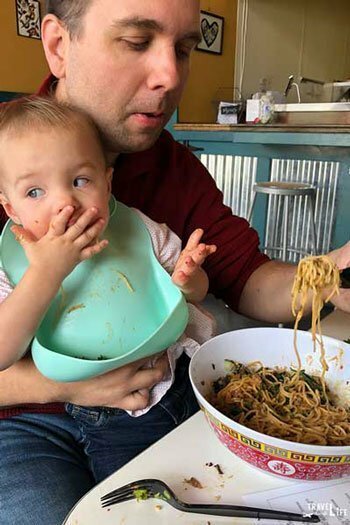 We once survived a 2-1/2 hour long tasting menu with a toddler. There were tears (from everyone) but we did it by taking shifts. In the three minutes that you’re left alone at the table to breathe, it’s possible to feel like you can do this parenting thing. Whether it’s popping out of the hotel room for a glass of wine after bedtime or being the one who chases the toddler around the bar, take turns with your partner. I once told my childless friend that my kid sleeps in the bathroom and she was completely terrified. If you are in a hotel that doesn’t have a large closet or a suite, the bathroom is a great place for a kid to sleep! It’s dark. It’s quiet. And it gives you a bit of separation. Also, if your kid isn’t loving the new sleeping arrangements, the bathroom does give an extra barrier to not disturb the people around you. Where do you pee? In the lobby. Or bring a sound machine with you and pray that you don’t wake the toddler up! We get asked a lot about “kid-friendly” restaurants. 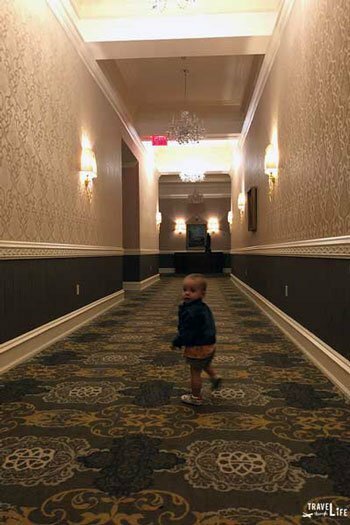 I decided from the beginning that we didn’t want to only highlight travel with a toddler because we believed that our child was along for the ride with us! We wanted to do the same things we did before, except with our little sidekick! And honestly, we have. We still went to kids museums pre-child and we still go now! 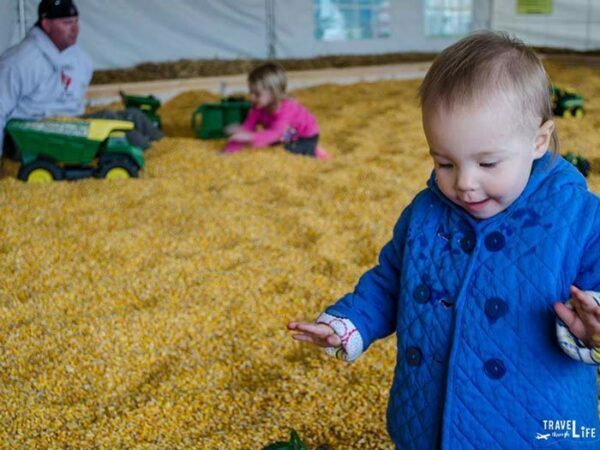 We take our child to breweries, distilleries, and festivals. Our only rule? If the restaurant has a tablecloth, no toddler. More than likely, those are fine dining places that aren’t going to have a high chair or want a toddler in their establishments anyway. So if we’re cruising Yelp or TripAdvisor, I’ll look at the pictures to see if there are tablecloths. Everywhere else is fair game! Yes, there are going to be times where your child is a mess. I mean, an on-the-floor-total-meltdown-throwing-food-screaming mess. Go anyway. 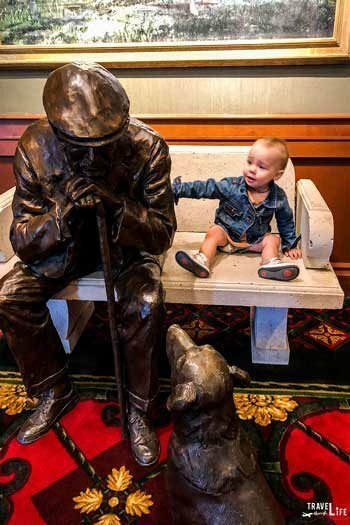 It’s okay to travel with a toddler regardless of those painful moments. There have been times where my child was screaming her brains out in the middle of a charity dinner. We stayed anyway. She threw duck frites on the floor and tried to get fresh with a world-renowned chef. (We apologized and promptly told her to buy him a drink first). What I’m saying is, don’t let your fear of the unknown hold you back. Toddlers are highly unstable, meaning they could be an absolute terror at home with you but an angel out in public. Take the trip, book the hotel, and you will all survive. Surviving toddlerhood will be hard sometimes, but the memories make it worth all the struggles. Show your child the world, and they might teach you something in return. 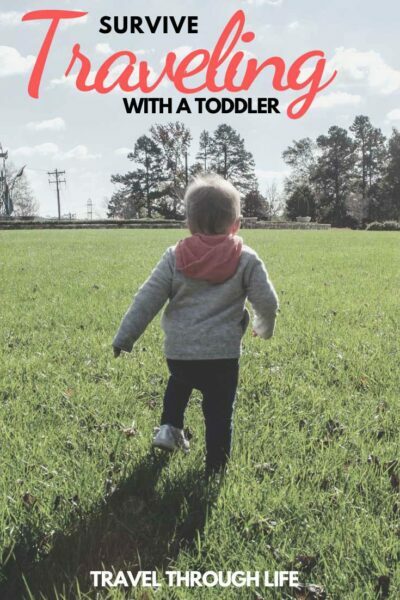 This article about toddler travel was originally created on November 12, 2018. It has been maintained and updated (as of April 15, 2019) to reflect current viewpoints and travel trends. It is also a part of our series on travel with kids tips. Here, we’ve also covered baby travel from the beginning to the older stages, and can’t wait to keep sharing what we find as our little one grows up every day!